A recent study affiliated with UNIST has developed a system that produces electricity and hydrogen (H2) while eliminating carbon dioxide (CO2), the main contributor of global warming. This breakthrough has been led by Professor Guntae Kim in the School of Energy and Chemical Engineering at UNIST in collaboration with Professor Jaephil Cho in the Department of Energy Engineering and Professor Meilin Liu in the School of Materials Science and Engineering at Georgia Institute of Technology. 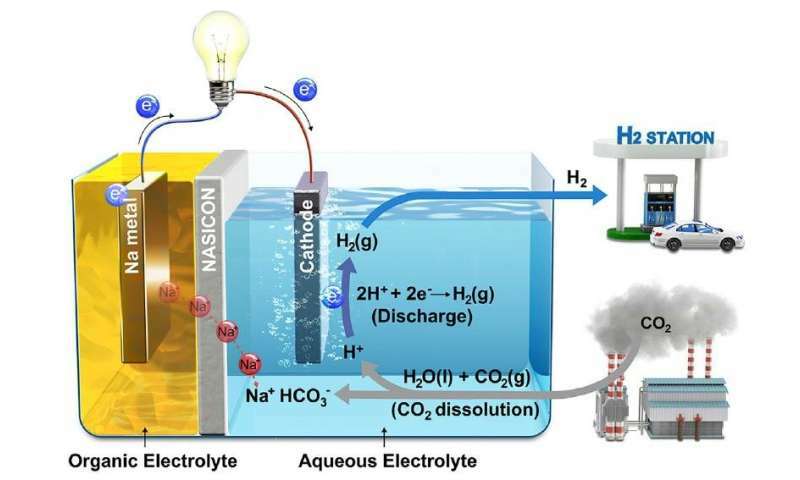 In this work, the research team presented a hybrid Na-CO2 system that can continuously produce electrical energy and hydrogen through efficient CO2 conversion with stable operation for over 1,000 hours from spontaneous CO2 dissolution in aqueous solution. A percentage of human CO2 emissions is absorbed by the ocean and turned into acid. The researchers focused on this phenomenon and came up with the idea of melting CO2 into water to induce an electrochemical reaction. If acidity increases, the number of protons increases, which in turn increases the power to attract electrons. A battery system based on this phenomenon can produce electricity by removing CO2. Their Hybrid Na-CO2 System, just like a fuel cell, consists of a cathode (sodium metal), separator (NASICON), and anode (catalyst). Unlike other batteries, catalysts are contained in water and are connected by a lead wire to a cathode. When CO2 is injected into the water, the reaction starts, eliminating CO2 and creating electricity and H2. The conversion efficiency of CO2 is 50 percent. "This hybrid Na-CO2 cell, which adopts efficient CCUS technologies, not only utilizes CO2 as the resource for generating electrical energy but also produces a clean energy source, hydrogen," says Jeongwon Kim in the Combined M.S/Ph.D. in Energy Engineering at UNIST, the co-first author for the research. This system has shown stability to the point of operating for more than 1,000 hours without damage to electrodes. The system can be applied to remove CO2 by inducing voluntary chemical reactions. "This research will lead to more derived research, and will be able to produce H2 and electricity more effectively when electrolytes, separator, system design and electrocatalysts are improved," said Professor Kim.